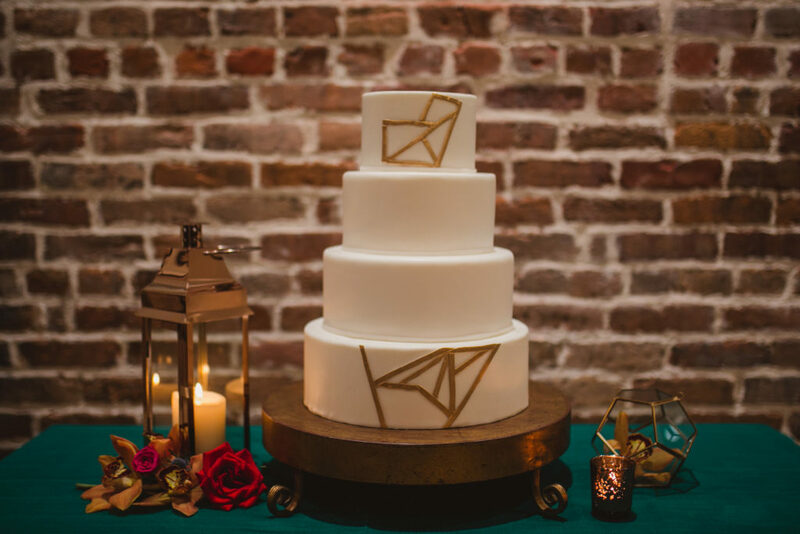 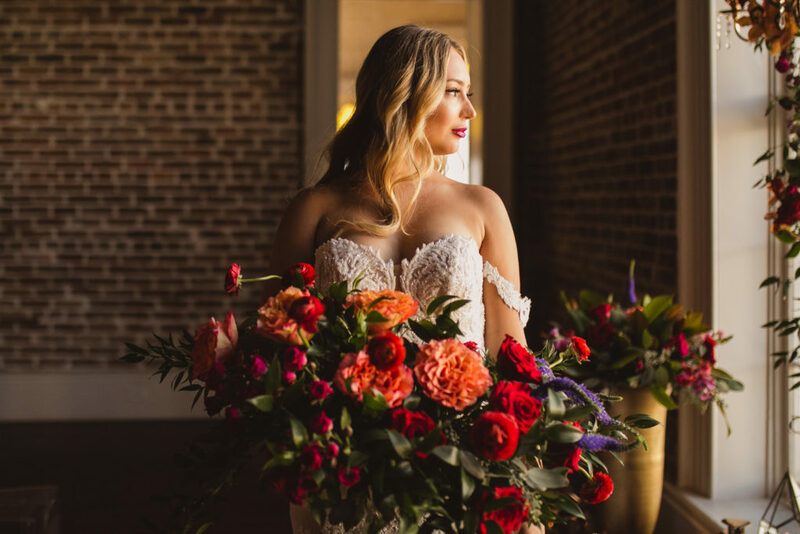 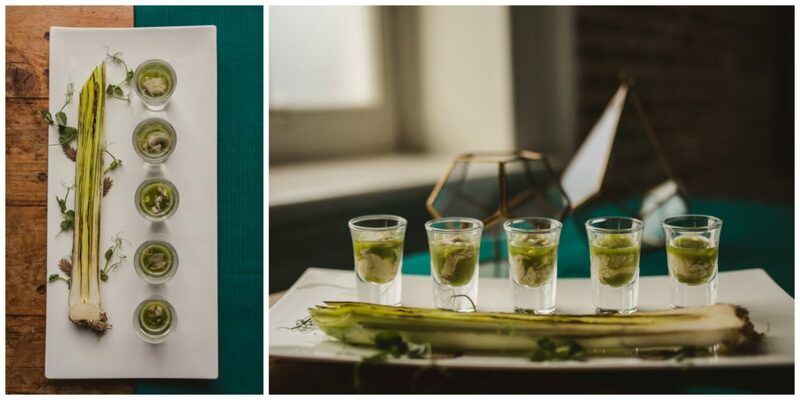 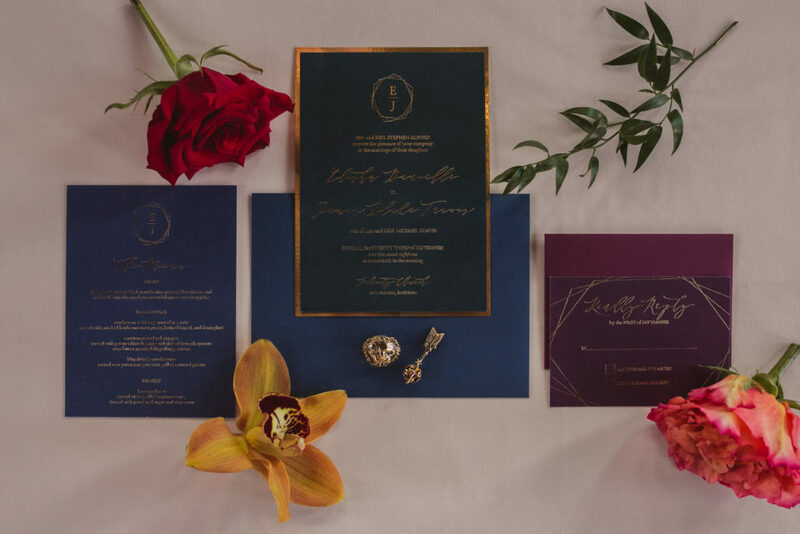 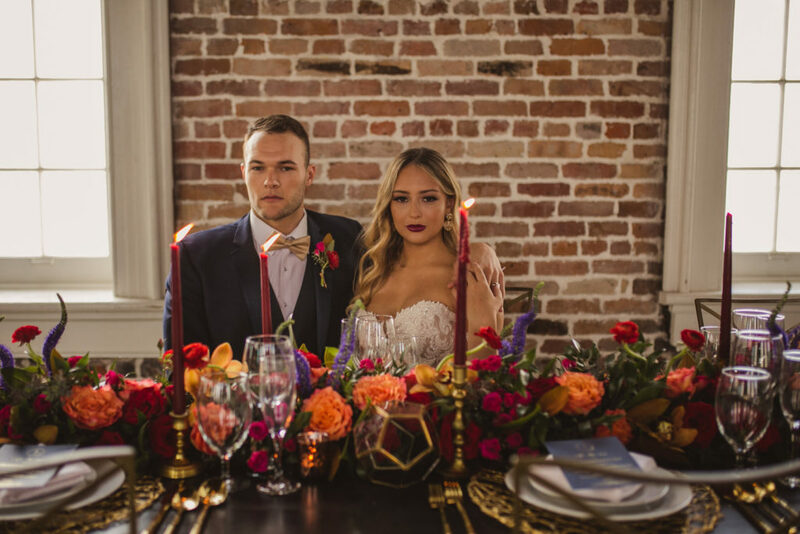 The collaborators behind this styled shoot wanted to bring bold, beautiful colors and geometric patterns to a classic, historic New Orleans venue that is typically adorned with greenery, white, and subtle hues. 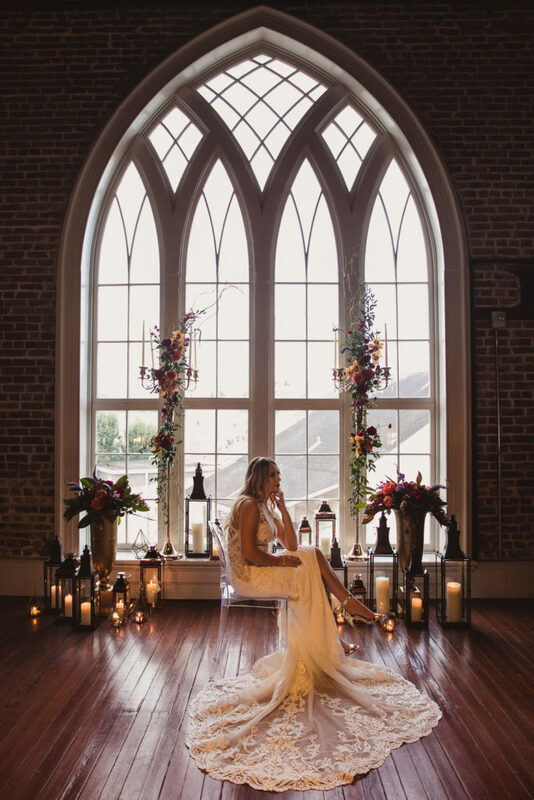 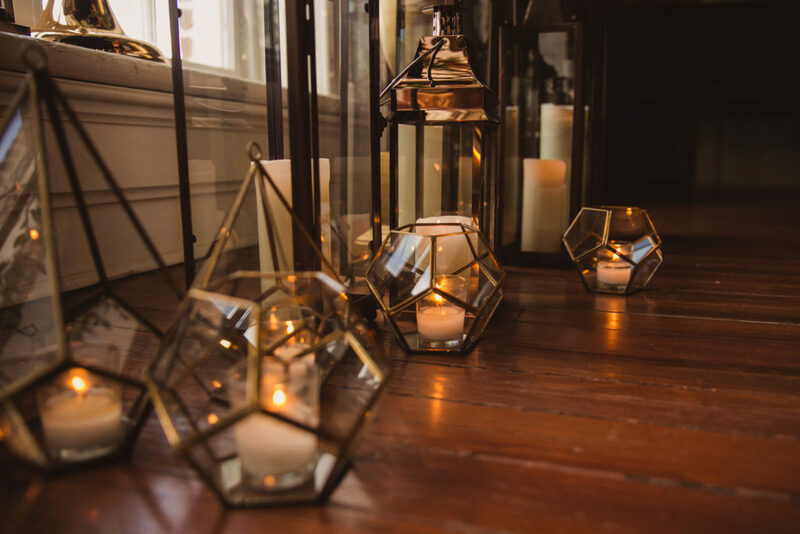 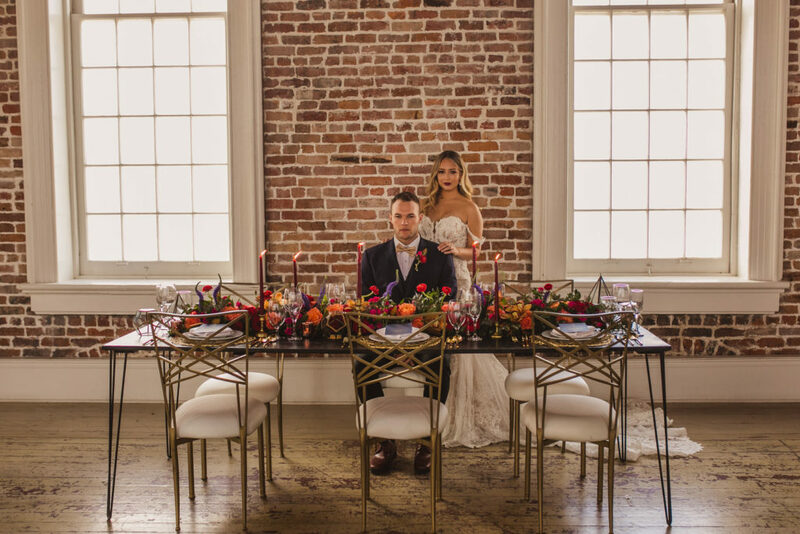 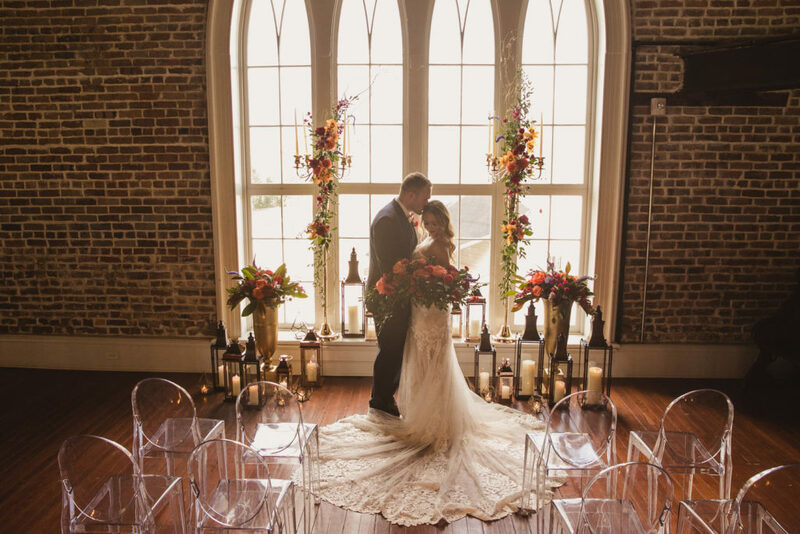 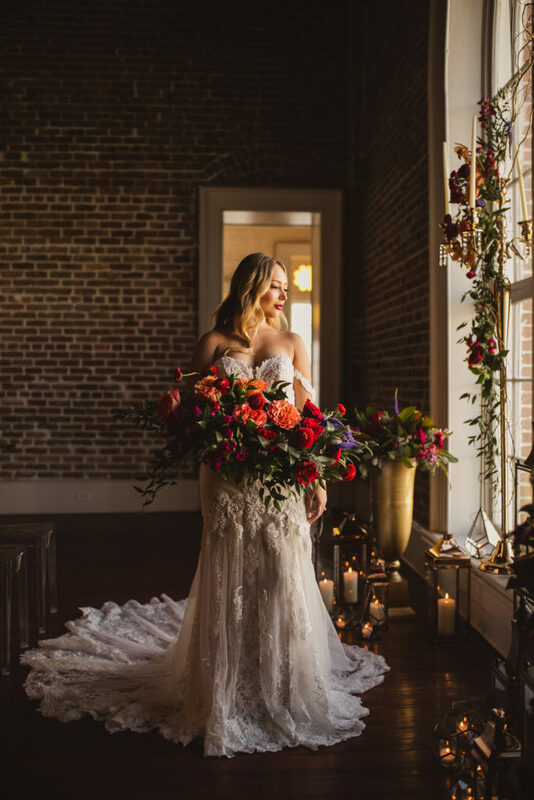 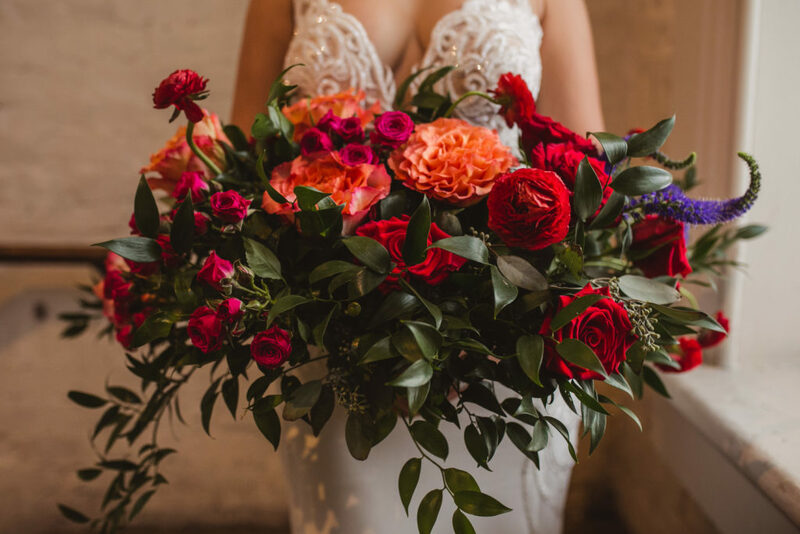 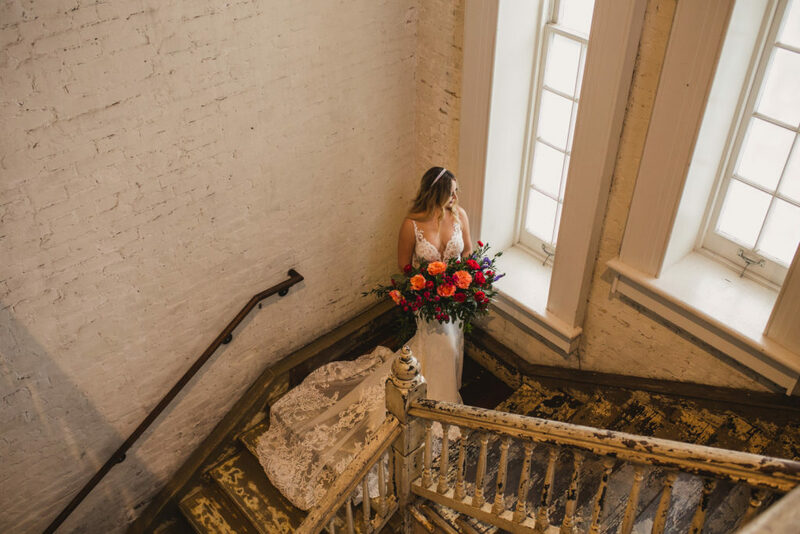 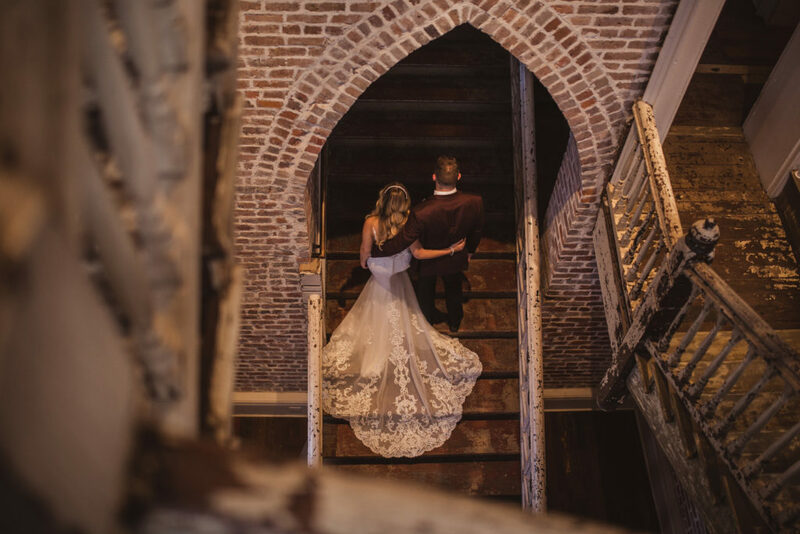 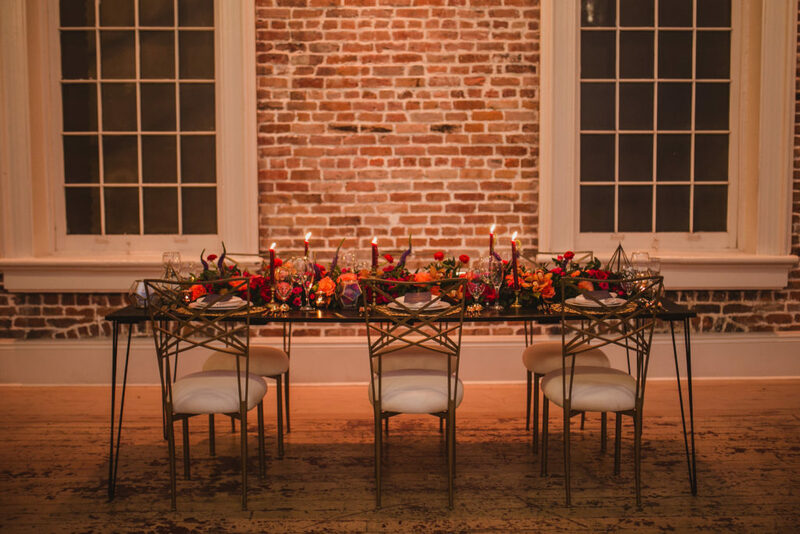 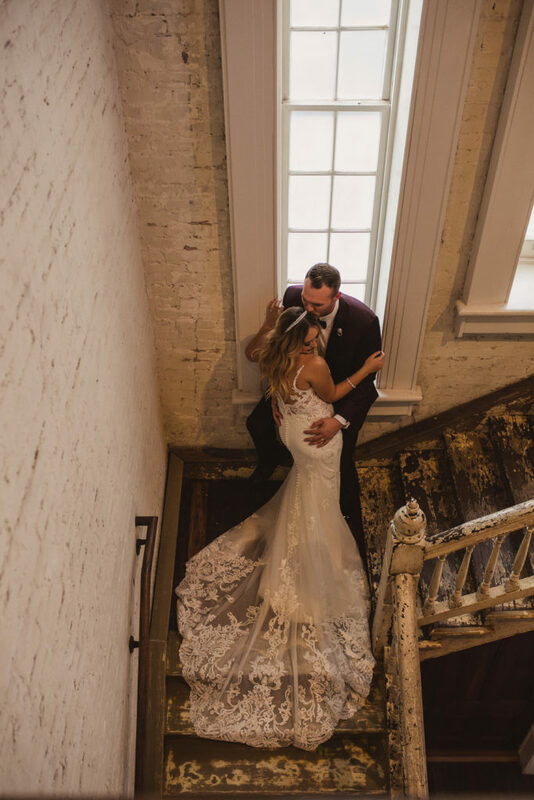 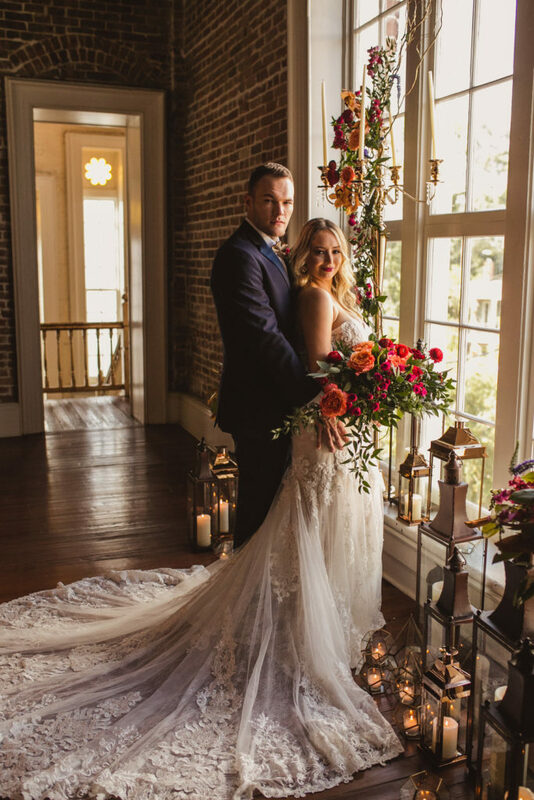 This shoot tells the story of a modern couple, one that loves the history and style that Felicity Church brings as a historic building in the city of New Orleans and who wanted to transform the space to bring a bold, bright, vibrant touch to fit their elegant style. 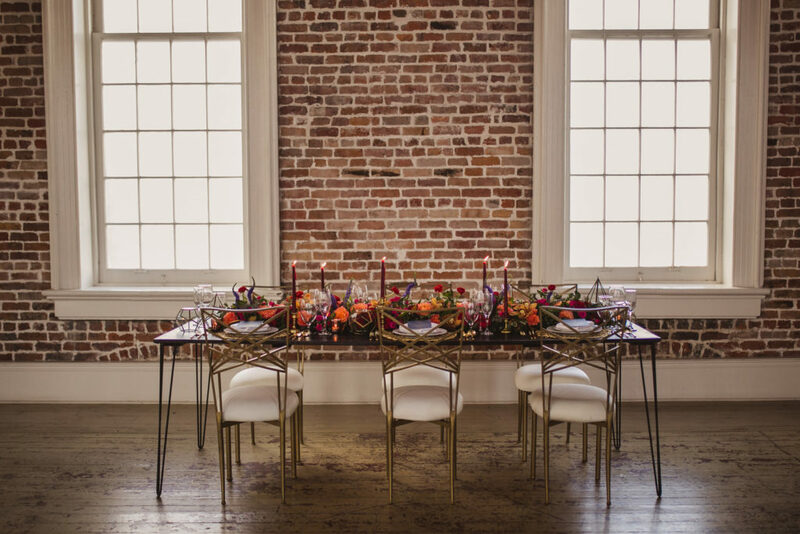 The coordination of geometric patterns, mixed metals, and bold colors brought an unusual element to this space. 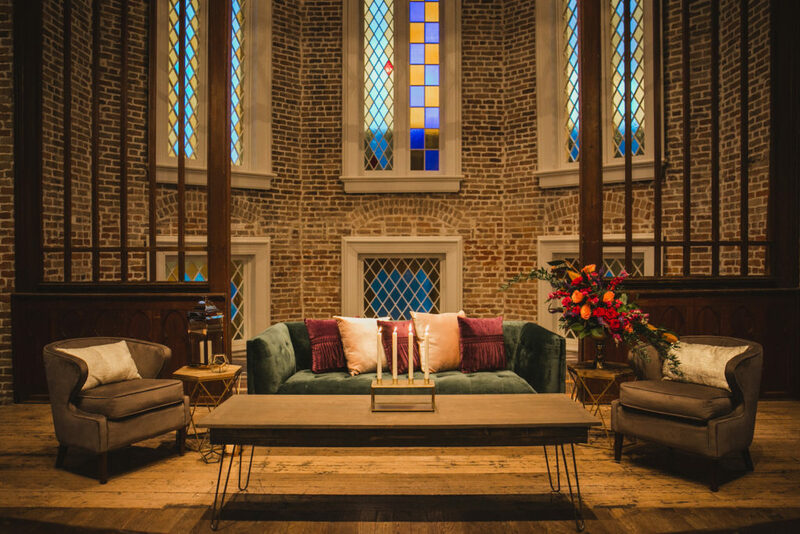 The third floor of the venue, which was once the choir area when the venue operated as a church years ago, has never been used as a ceremony space. 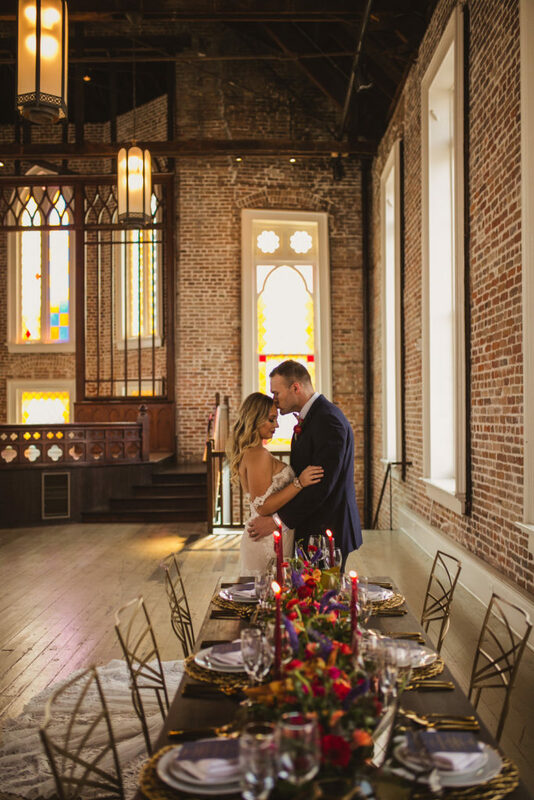 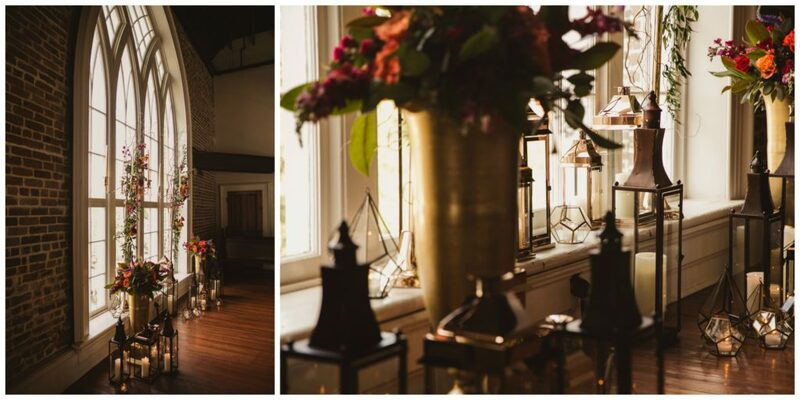 With the tall, arched windows in the private setting, we created an intimate space for the couple’s ceremony that brought all of the elements of the room into play – including the brick,windows, and sunlight that cast a beautiful light over the couple. 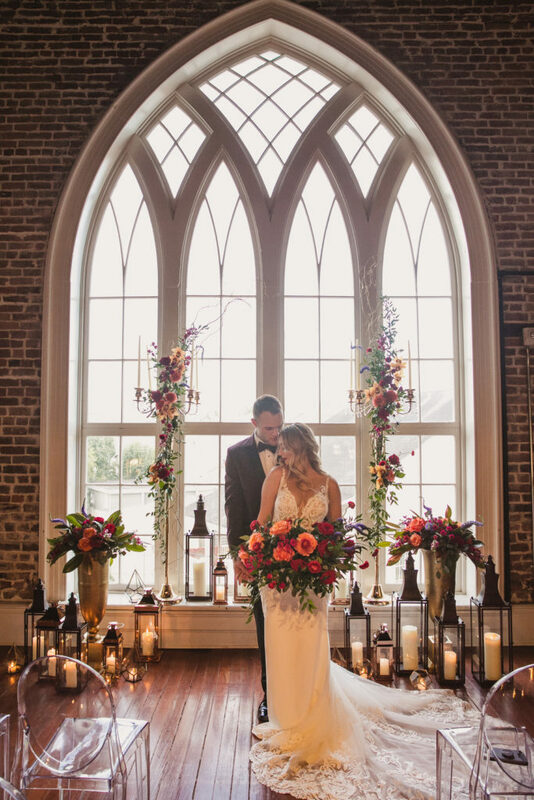 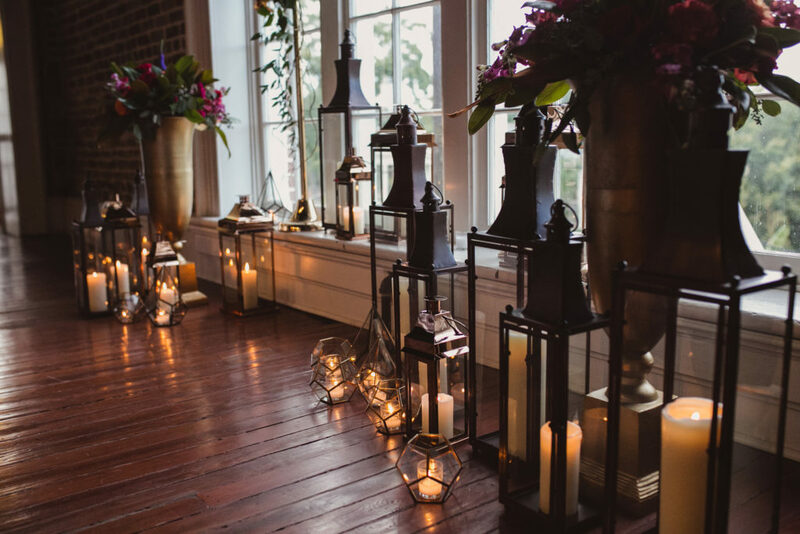 They used asymmetric floral arrangements coordinated with tall candelabras, lanterns of various heights, and geometric candle holders all of mixed metals to flank each side of altar to add an ambiance of warmth and intimacy. 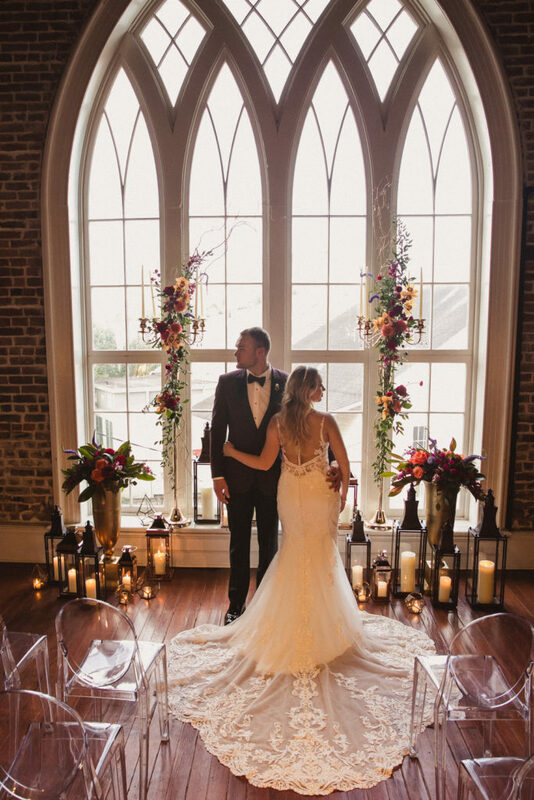 This area provided for a ceremony with the couple’s immediate family and closest friends, and allowed the couple to instantly greet the remainder of their guests downstairs in the church after the ceremony. 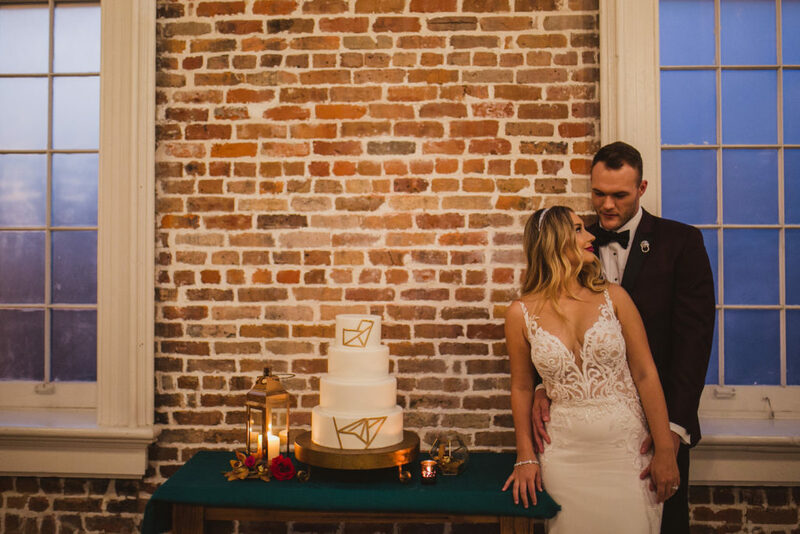 With two styles, the couple was able to take on a more classic look for their ceremony and a modern, elegant look for the remainder of the evening. 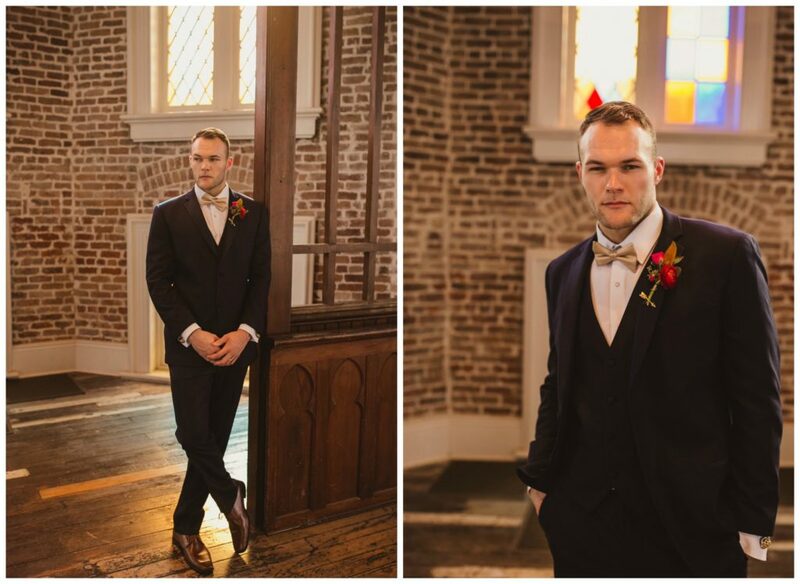 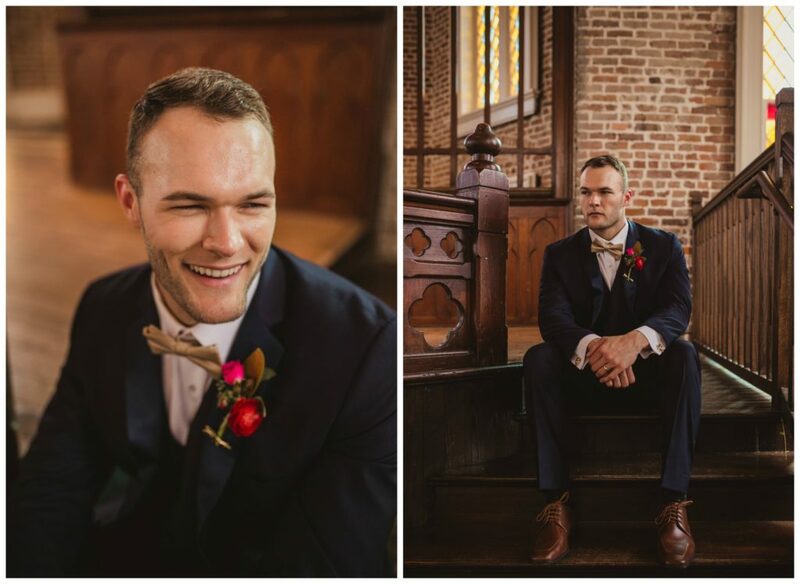 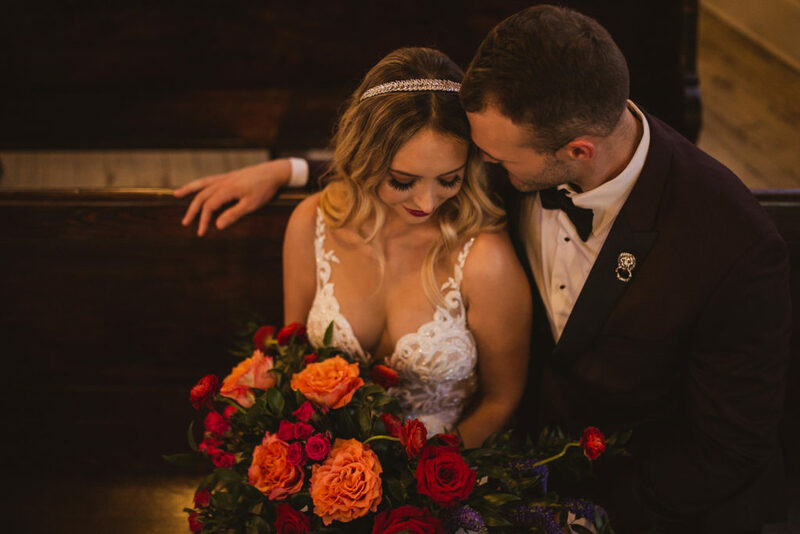 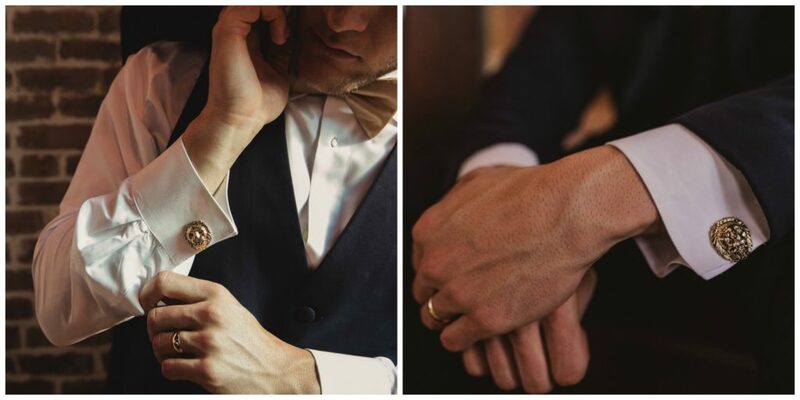 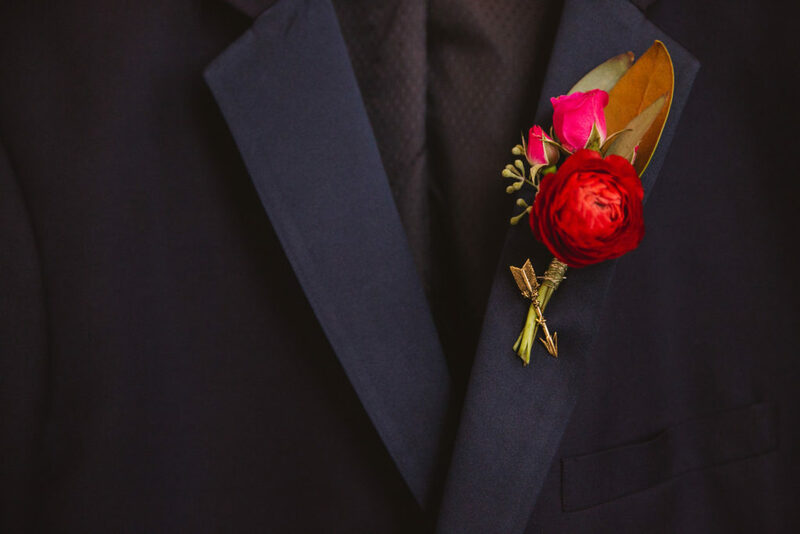 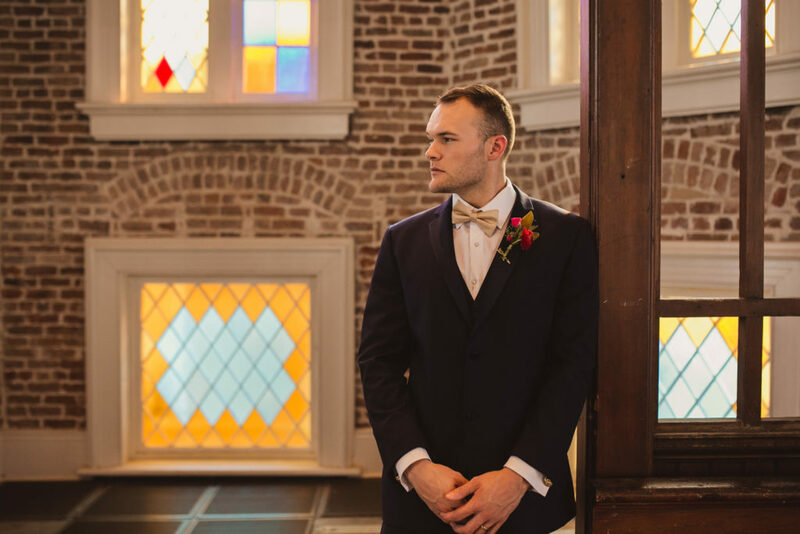 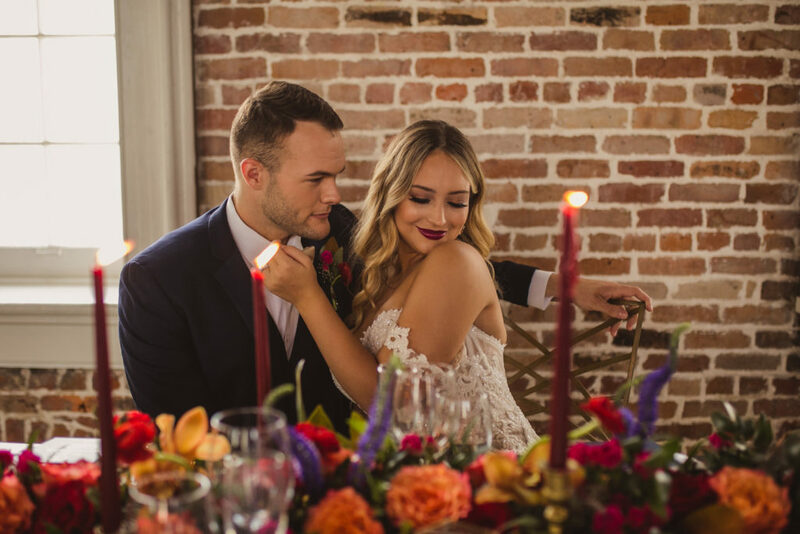 During the ceremony, the groom boasted a gold arrow lapel pin (Reagan Charleston Jewelry) through his boutonniere, symbolizing the uncontrollable desire and love he feels towards his bride. 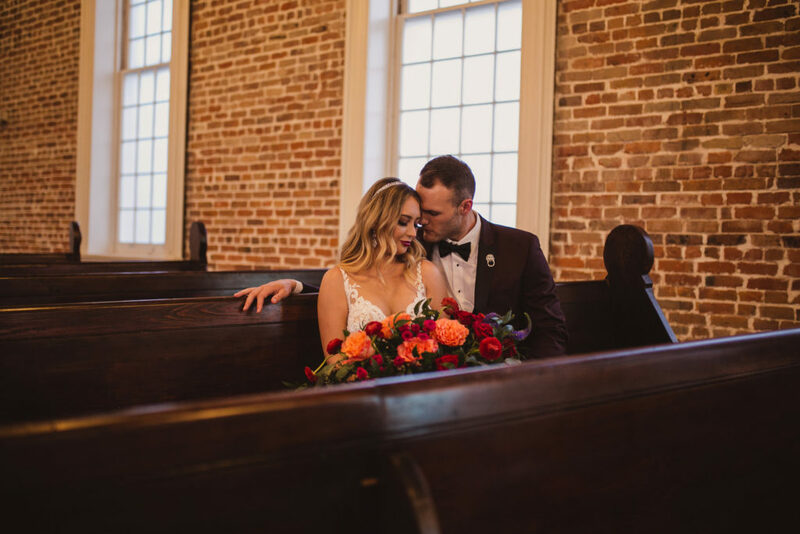 On the burgundy Marbella tuxedo, the groom accentuated with Leone cufflinks (Reagan Charleston Jewelry), a symbol of power, courage and nobility for his new family. 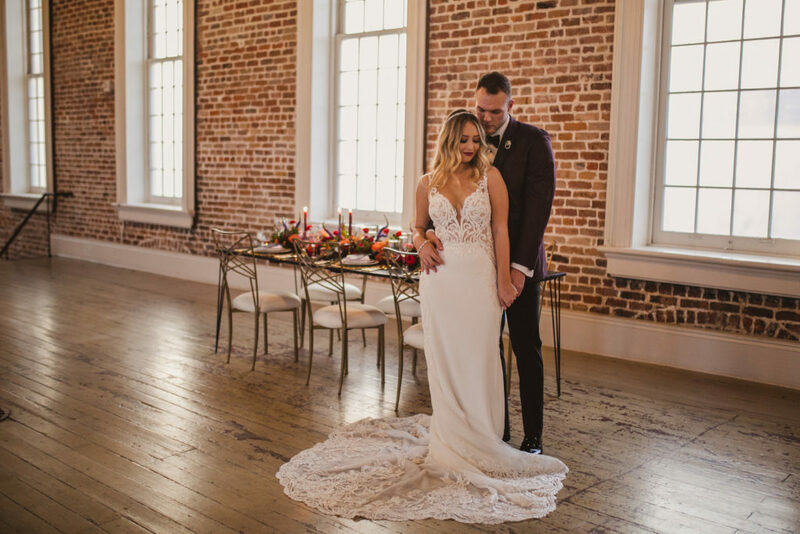 The bride flaunted two gowns, both accentuating her figure and matching the stylistic vibe of the evening. 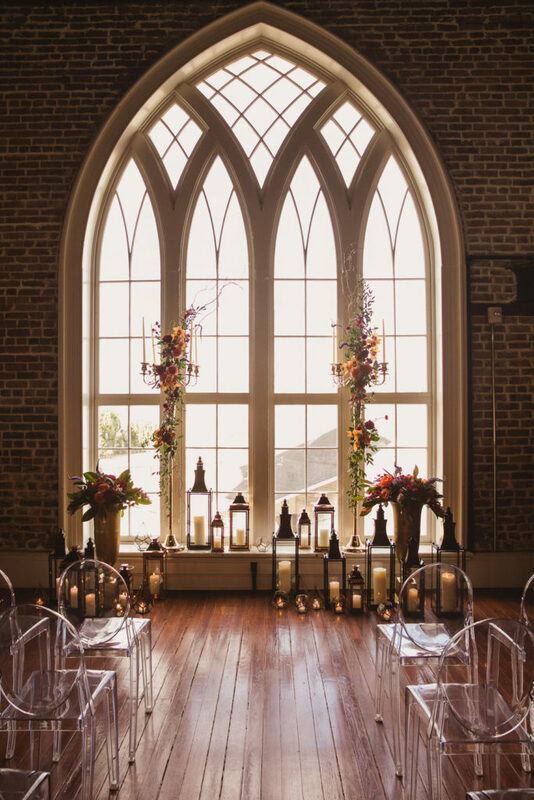 The table for the bride and groom and their closest friends was a focal point of the room – positioned on center between windows and panes of stained glass – which allowed for remarkable views that showed the character of the historic church regardless of where you were seated. 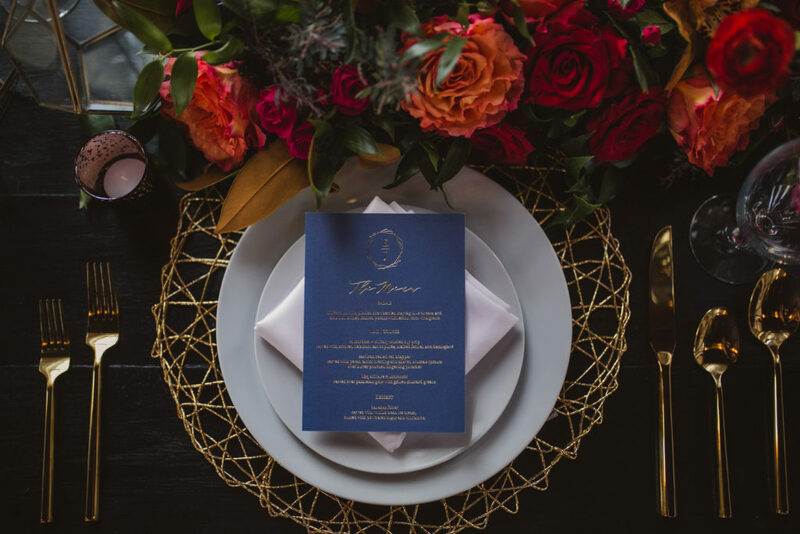 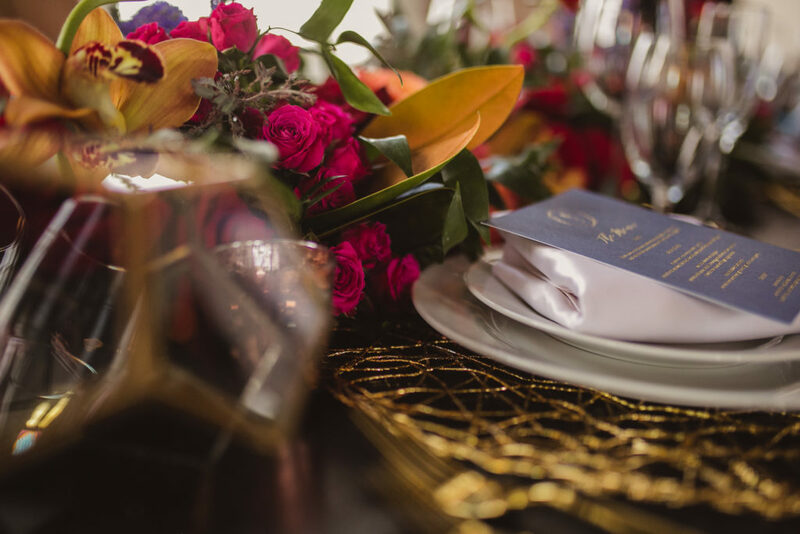 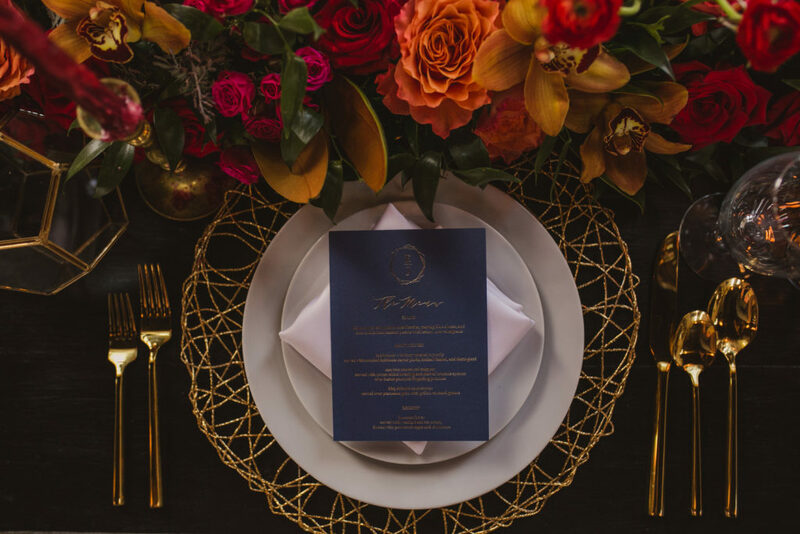 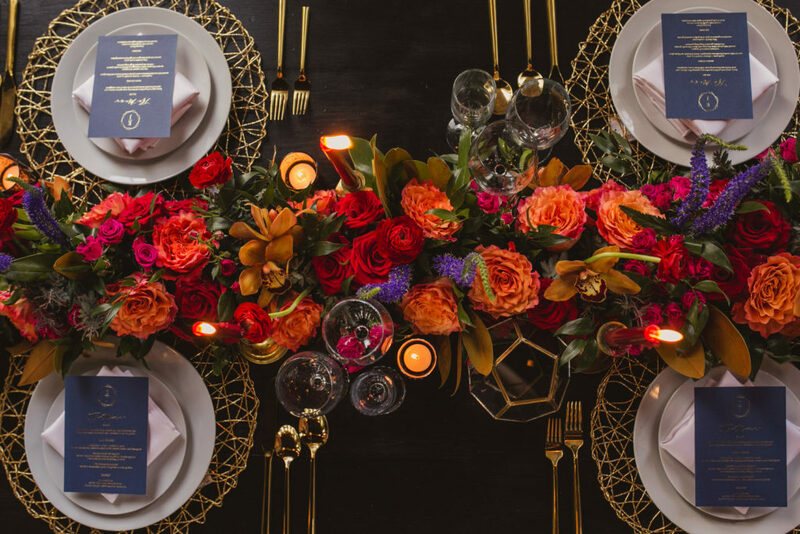 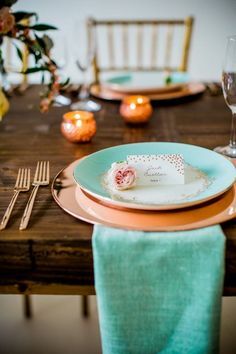 The tablescape was decked with a lavish, bright floral table runner combined with mismatched gold candlesticks paired with geometric flare in our chargers, décor, and chameleon chairs. 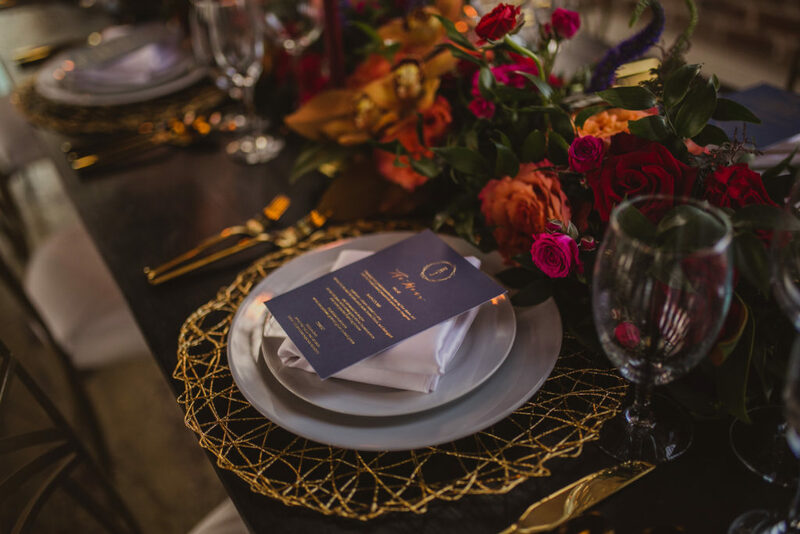 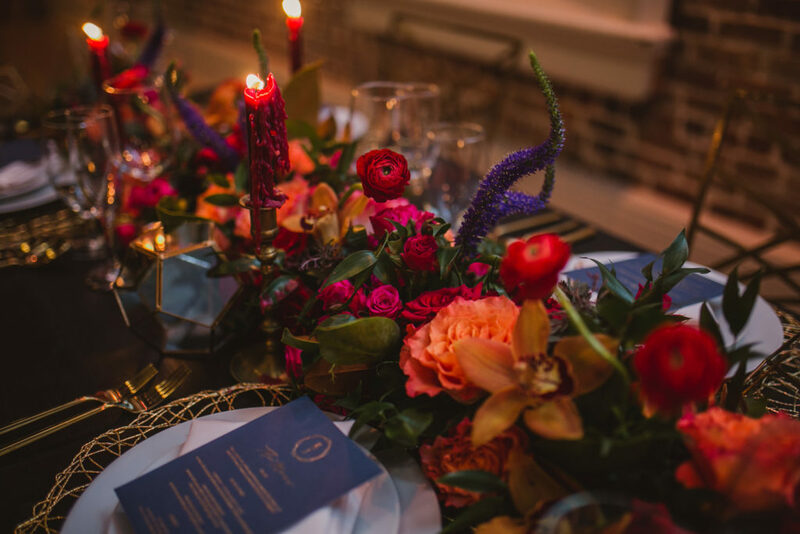 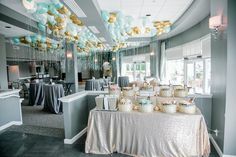 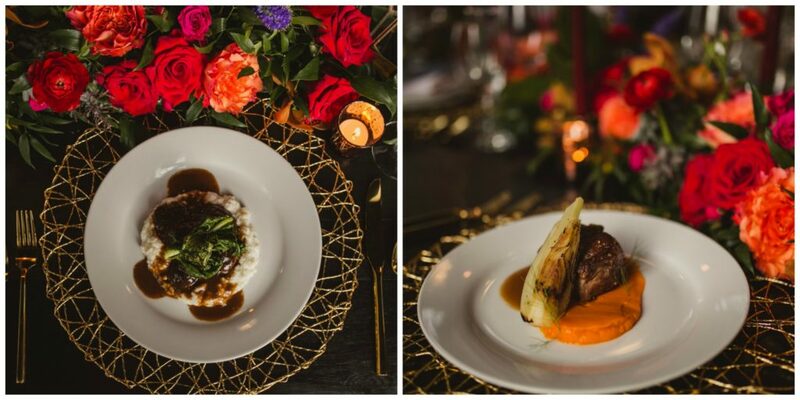 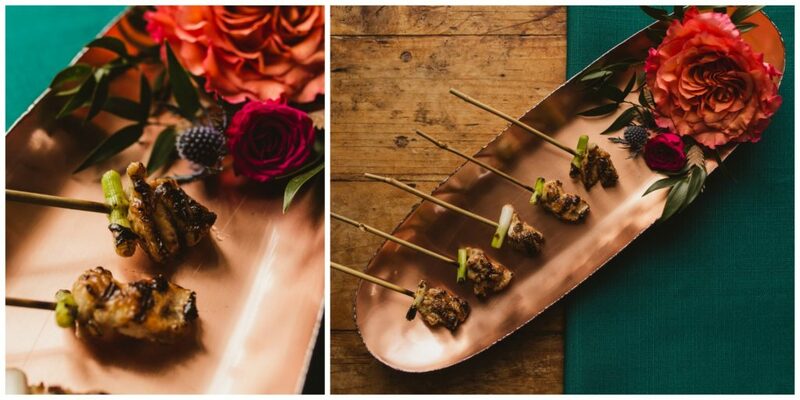 Guests were served passed hors d’oeuvres and a seated meal from Black Pearl Catering, who created dishes that perfectly complimented the bold, bright tones of the evening. 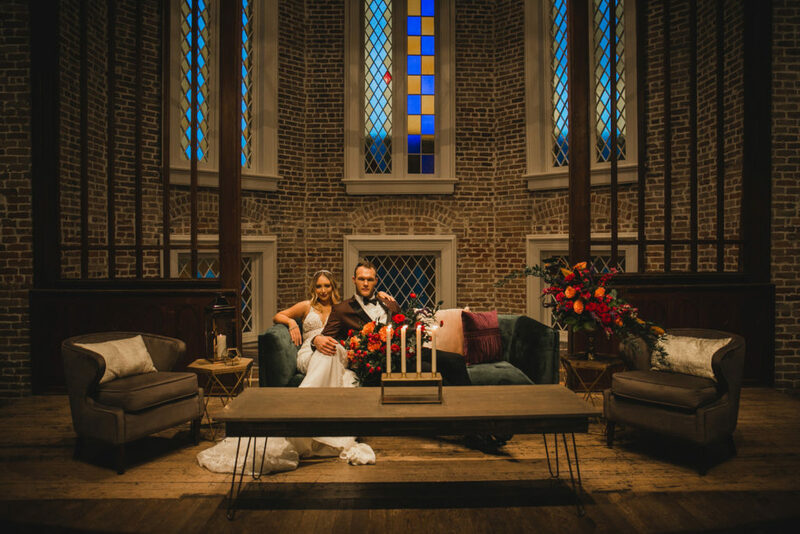 The lounge area on the altar – the area where all of the ceremonies in this church typically take place, served as a space for the bride and groom to relax and spend time alone together – but still be able to be immersed in the celebration while their guests enjoyed the evening. 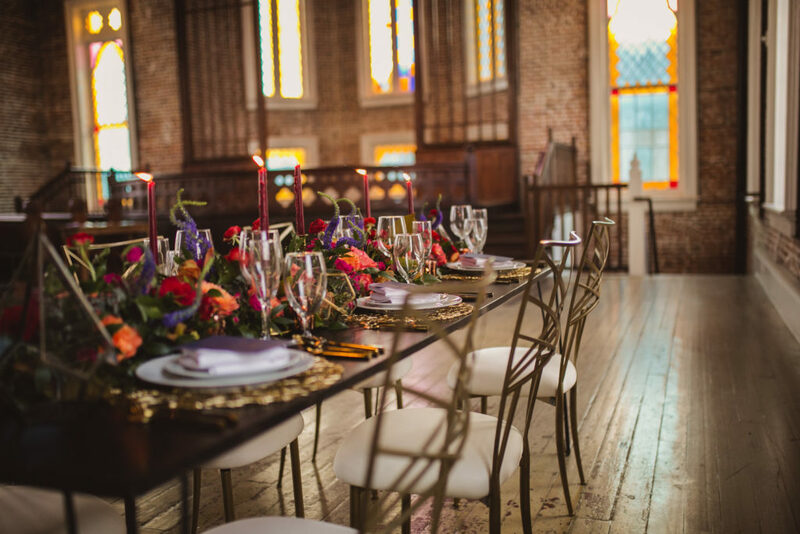 The bold colors of the furniture, coordinated with touches of the geometric pattern in the side tables and the free flowing floral arrangement, complimented the stunning stained glass windows and linear wood half walls of the altar. 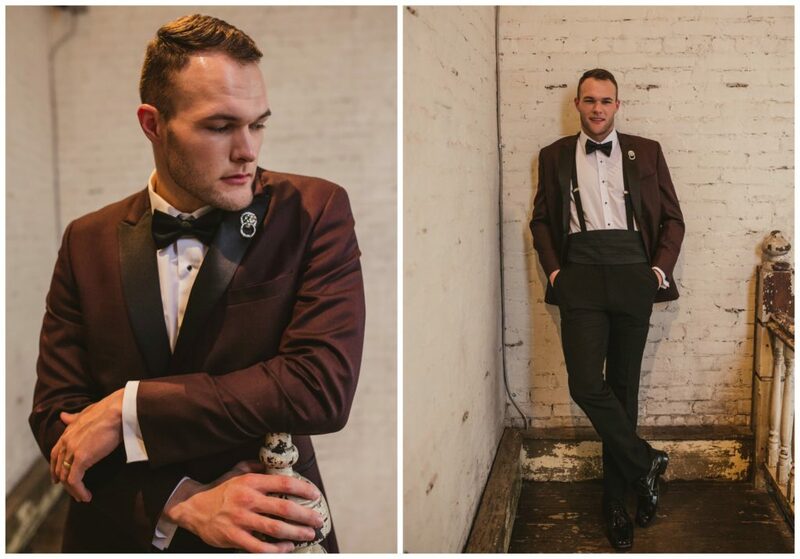 To make my vision come to life I collaborated with 16 other local vendors and 2 wonderful models. 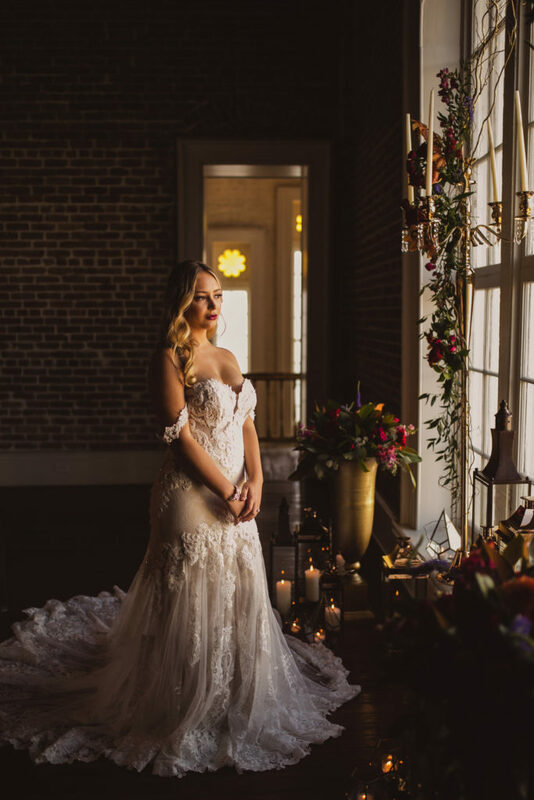 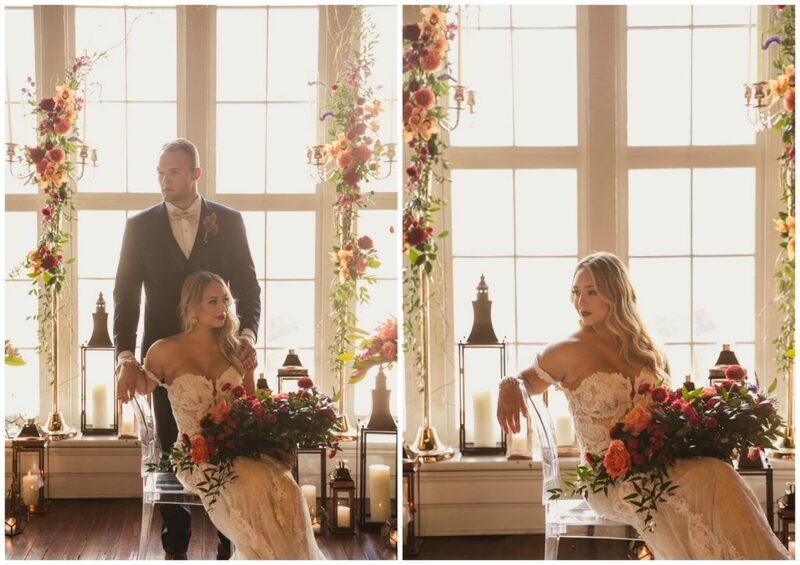 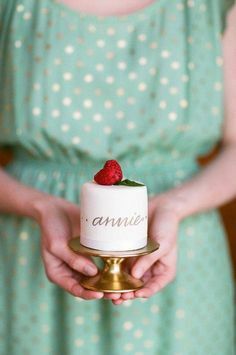 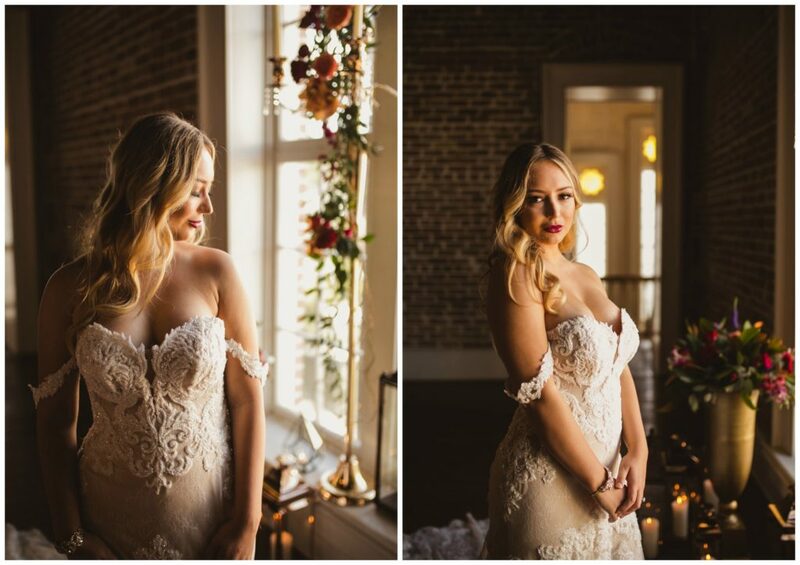 This was my first styled shoot and I absolutely loved every minute of working with the vendors. 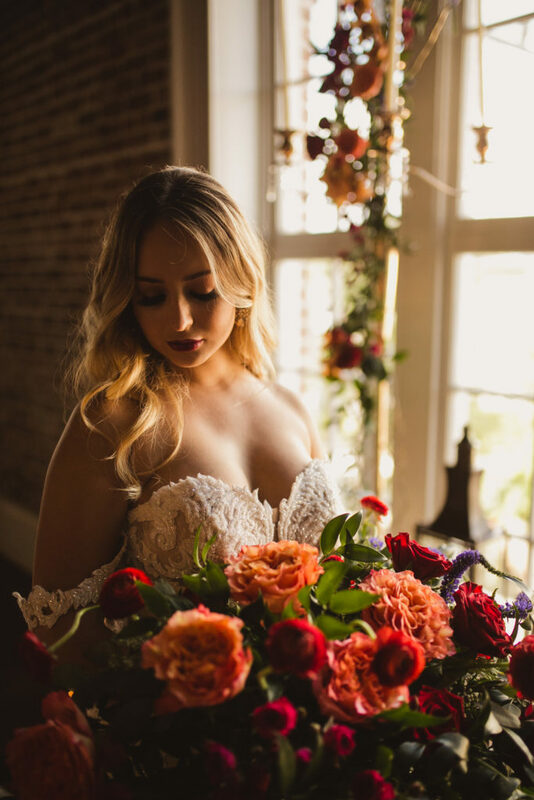 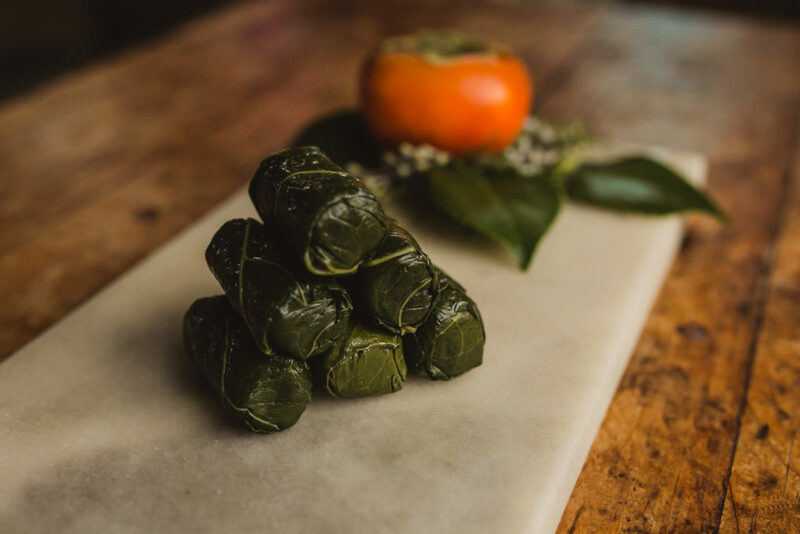 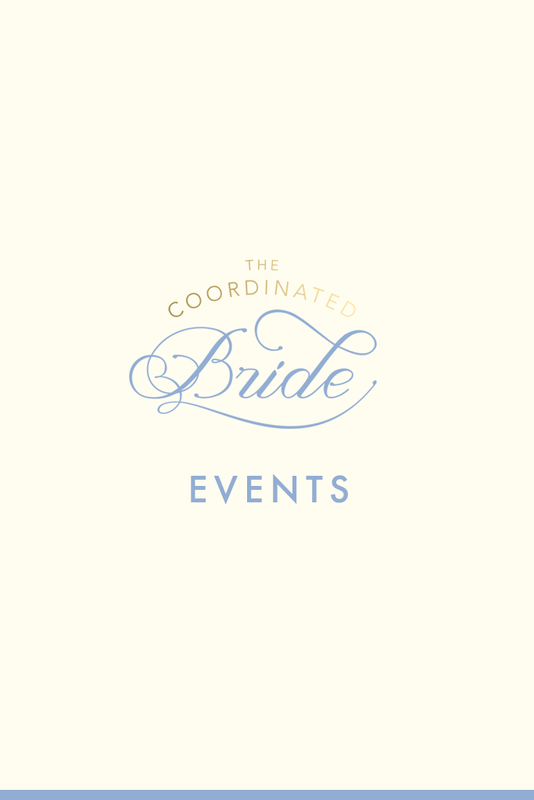 Participating in shoots allows you to have a creative freedom and collaboration with the vendors that you don’t often experience when doing a wedding because you are focusing on making a bride’s (or couple’s) dream come to life. 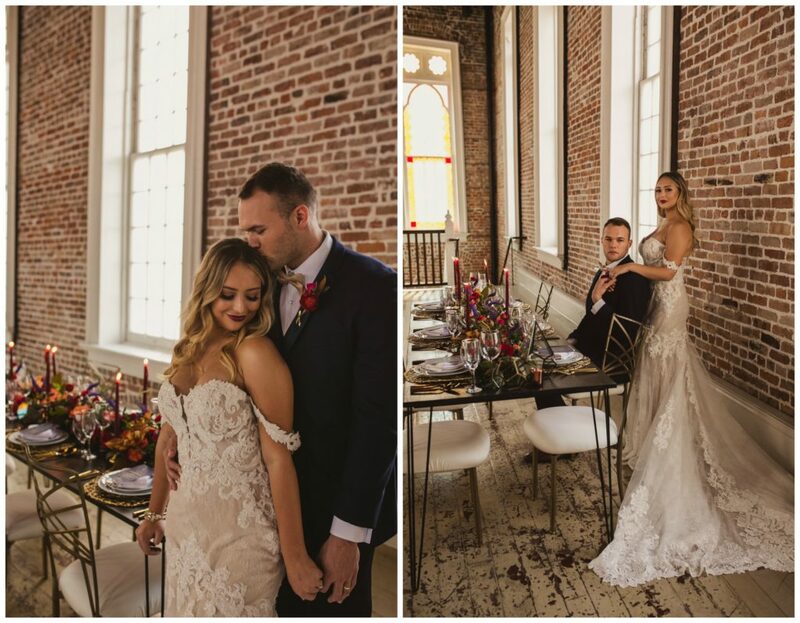 I really enjoyed being able to bring in some of my favorite vendors to work with and allow us all to participate in the design and production of this shoot. 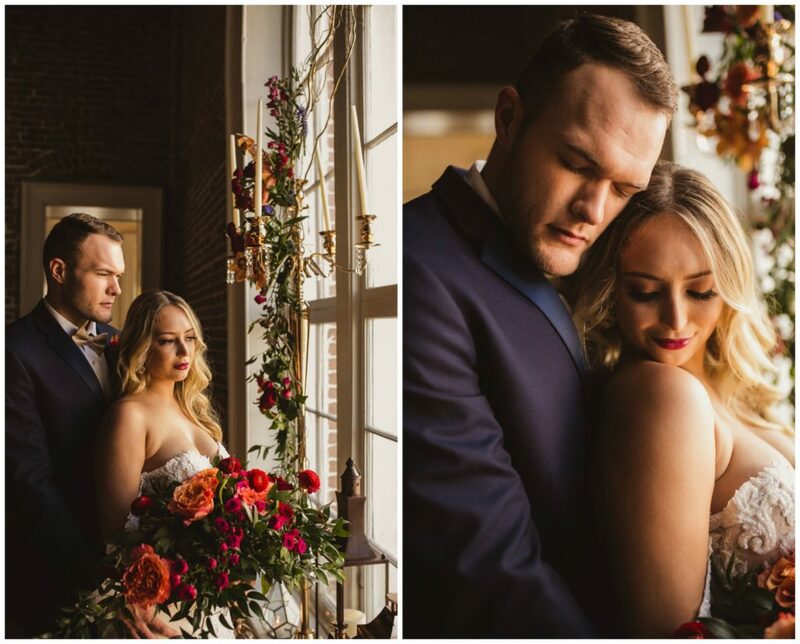 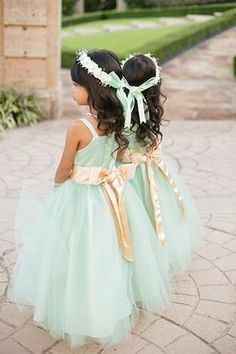 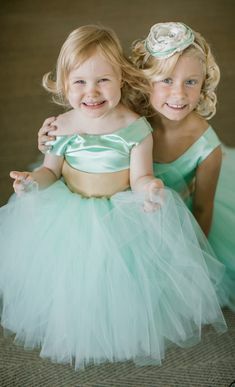 I am so glad that with the help of all our amazing team members we were able to create this elegant shoot and capture these extraordinary photos.